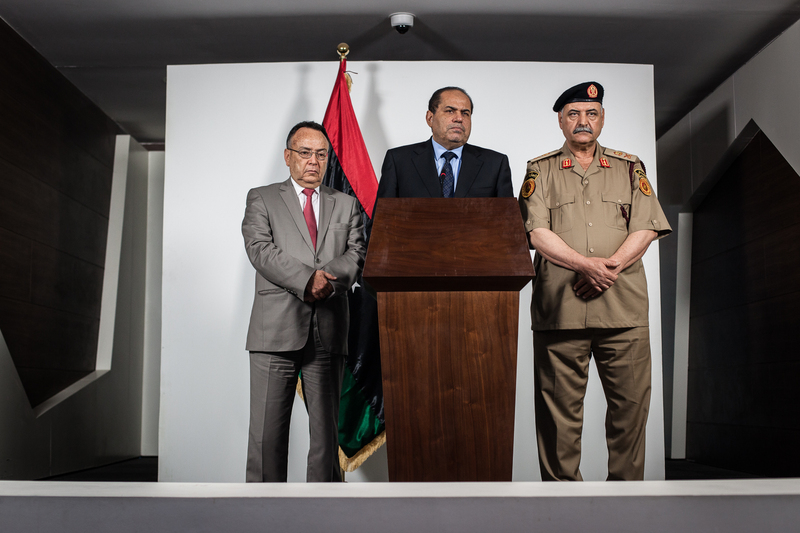 Four years after the fall of the Gaddafi regime, Libya has no united government. In the East, the Tobrouk government is recognized by the international community. In the West, the Tripoli government, formed by various former revolutionnary militias (Fajr Libya / Dawn of Libya), tries to impose its authority. 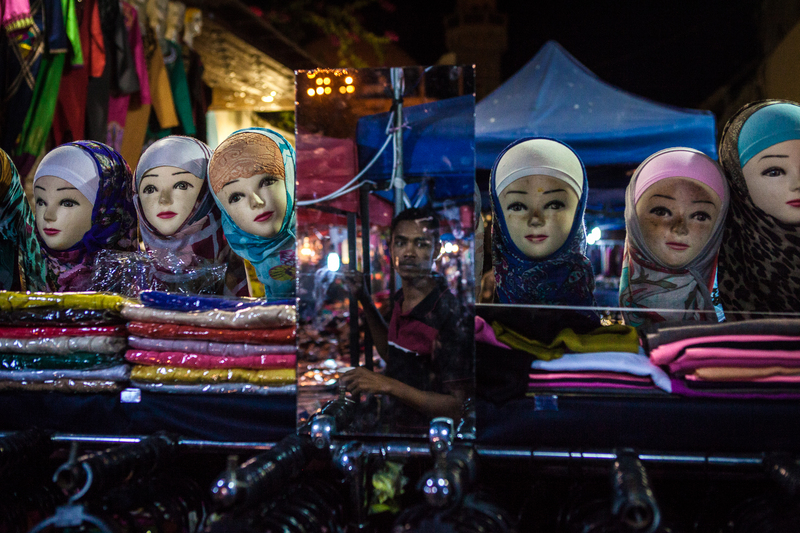 At the same time, the Islamic State (ISIS) has gained power in various places. 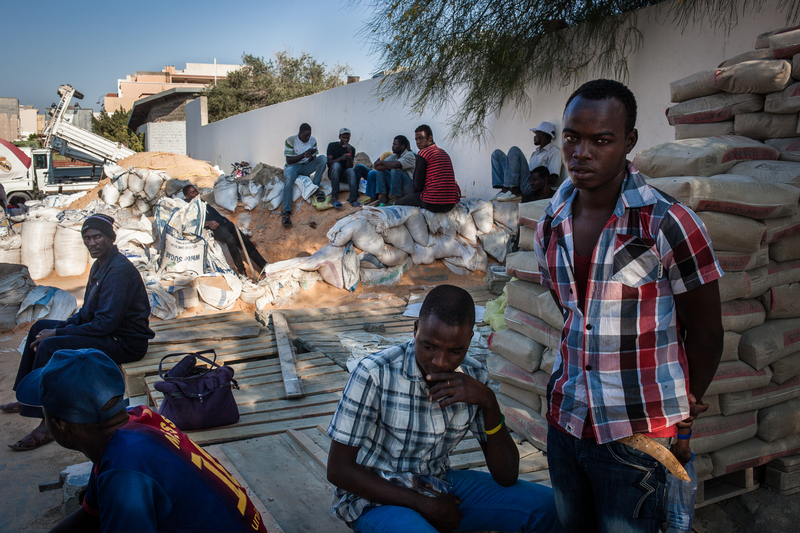 This political instability is driving migrants from Africa to cross the country, before trying to go to Europe. The ones who got arrested live in detention camps in very poor health conditions. Tripoli, 5th July 2015. Jean Frederic Poisson, french MP belonging to the Christian Democratic Party, is invited to Libya by the government of Tripoli, Fajr Libya (dawn of libya), unrecognized by the internaitonal community. He meets Mr. Mashallah Said, Oil and gas minister. Tripoli, July 7, 2015. 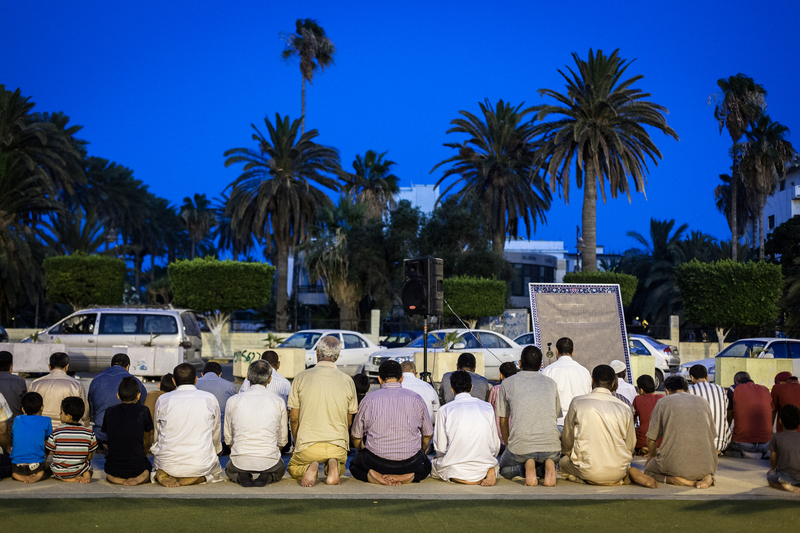 During a demonstration in support of Libya Fajr government (dawn of Libya), not recognized by the international community. 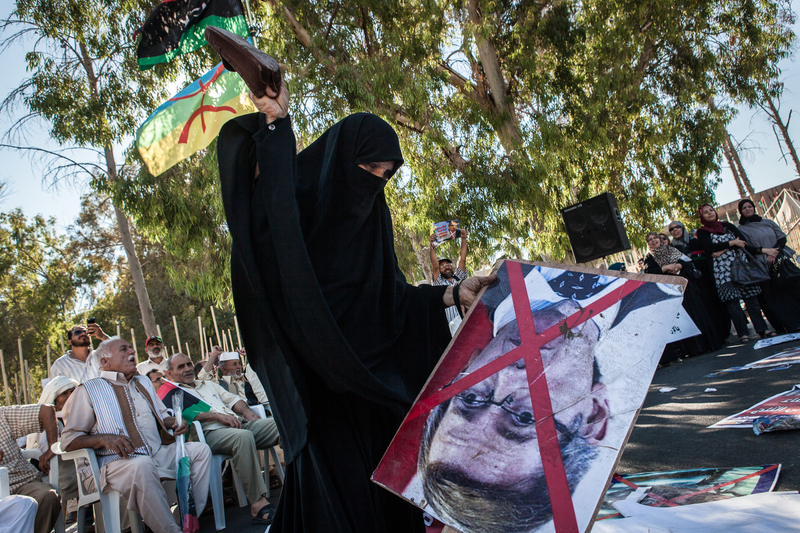 A protester smashes the image of Bernardino Leon, mandated by the UN to supervise the peace negotiations between the two Libyan governments. Tripoli, July 7, 2015. 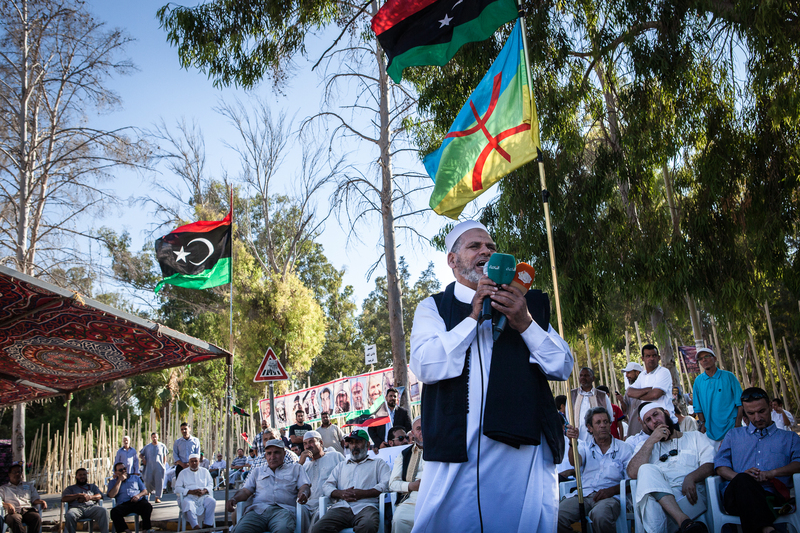 During a demonstration in support of Libya Fajr government (dawn of Libya), not recognized by the international community. Tripoli, July 8, 2015. Eritrean migrant children in the Detention Center, the headquarters of the Department of fight against illegal migration. The government of Fajr Libya, based in Tripoli, is looking for recognition from the international community. Aware that the living conditions in the camps are difficult, they ask for financial and logistical assistance to the West to successfully manage illegal migration transiting through its territory. Meanwhile, illegal migrants are crammed in unhealthy places, not allowed to go out or to have sufficient access to care. Tripoli, July 8, 2015. 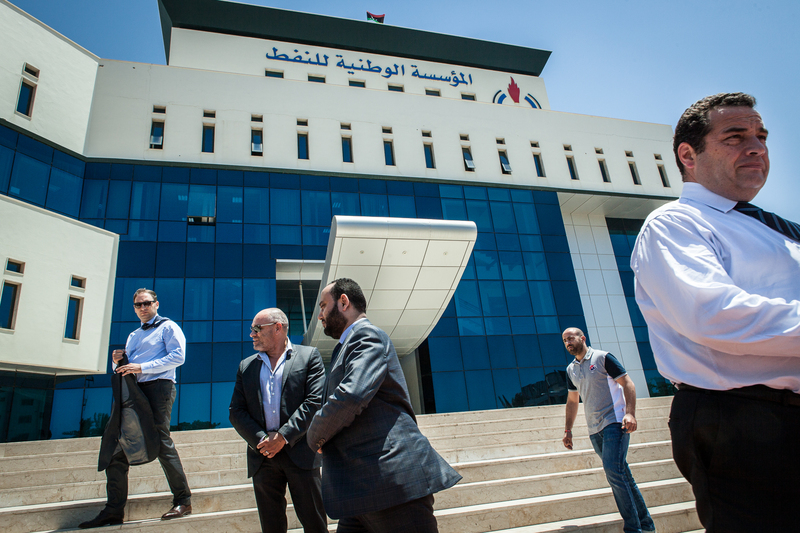 Detention Center in the headquarters of the Department of fight against illegal migration. The government of Fajr Libya, based in Tripoli, is looking for recognition from the international community. Aware that the living conditions in the camps are difficult, they ask for financial and logistical assistance to the West to successfully manage illegal migration transiting through its territory. Meanwhile, illegal migrants are crammed in unhealthy places, not allowed to go out or to have sufficient access to care. Tripoli, 4th of July 2015. 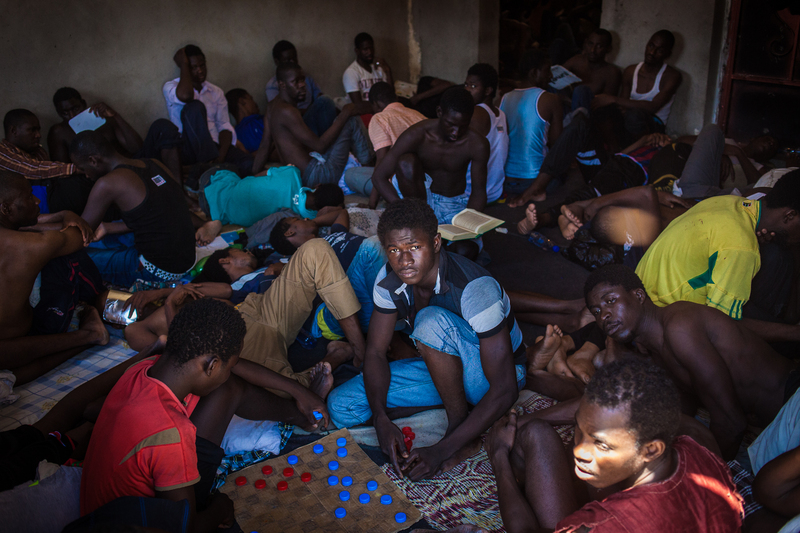 Detention camp for illegal migrants in garabuli, next to tripoli. Fajr Libya government (dawn of libya) is seeking for international recognition. They say they need an international aid (logistics and financial) to improve the difficult life conditions in these detention centers as well as the management of illegal migration in their country. 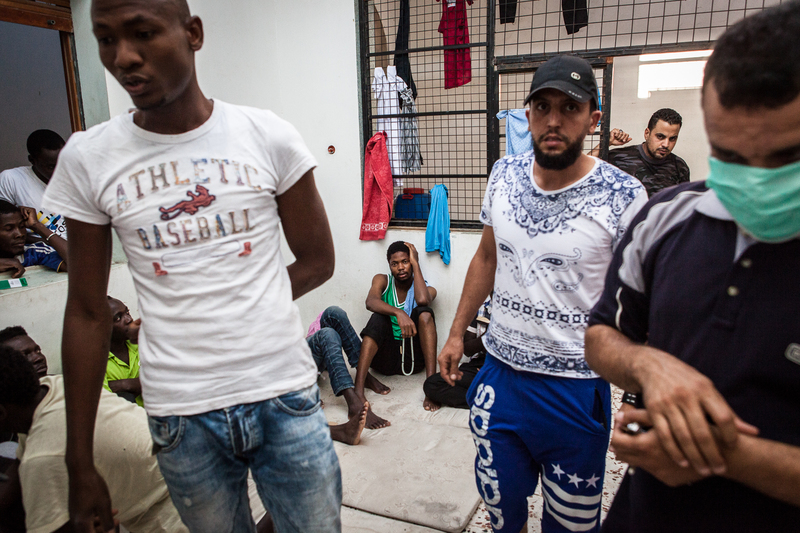 These migrants have almost no access to doctors and live in very bad health conditions. Tripoli, 4th of July 2015. 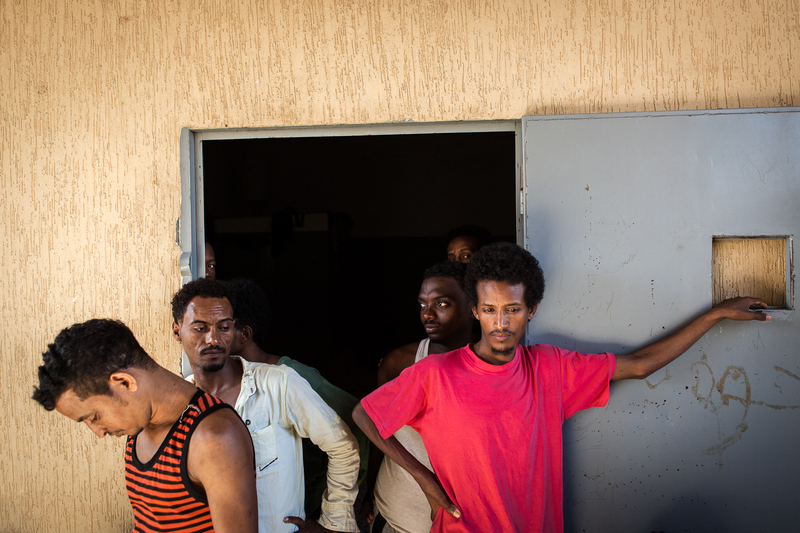 Detention camp for illegal migrants in garabuli, next to tripoli. Fajr Libya government (dawn of libya) is seeking for international recognition. 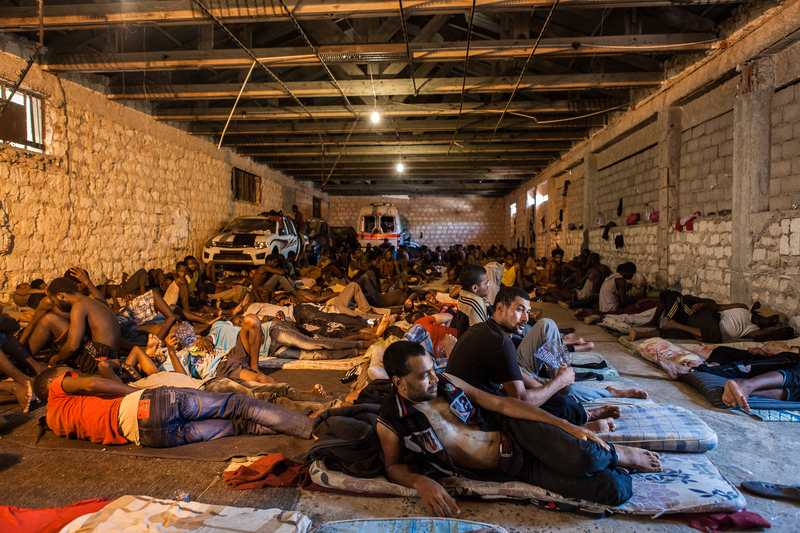 They say they need an international aid (logistics and financial) to improve the difficult life conditions in these detention centers as well as the management of illegal migration in their country. Tripoli, July 8, 2015. 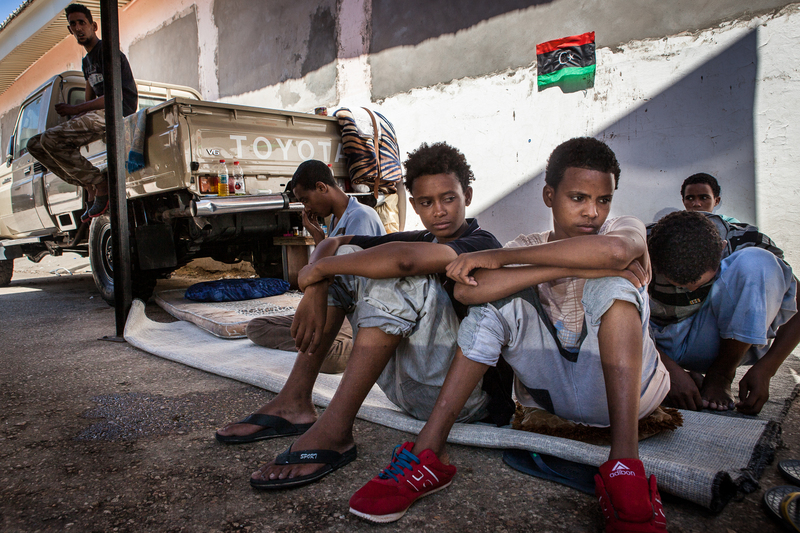 In some neighborhoods of Tripoli, illegal migrants are offering their services on the roadside. Masons, painters, electricians, some seek to earn money to send to their families back home, others are looking to accumulate money to pay the passage to Europe. All agree that in recent months, there is less and less work, and wages have been seriously reduced. They are regularly victims of scams, racketeering and even kidnappings. 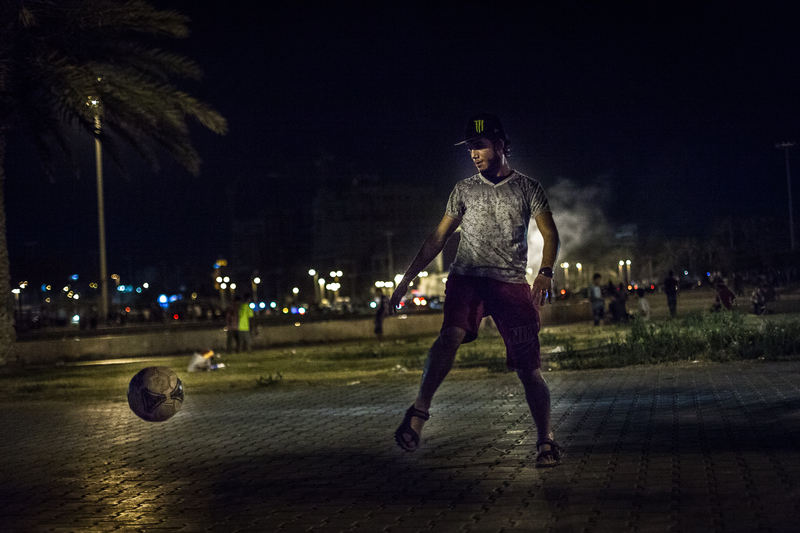 Tripoli, July 9, 2015. 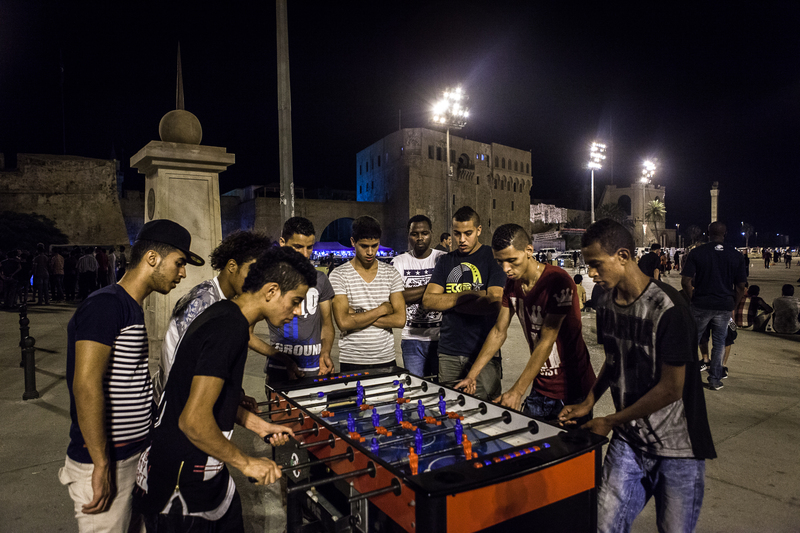 Soon after breaking the fast of Ramadan, families and youth groups meet at Martyrs Square in Tripoli in a friendly atmosphere. 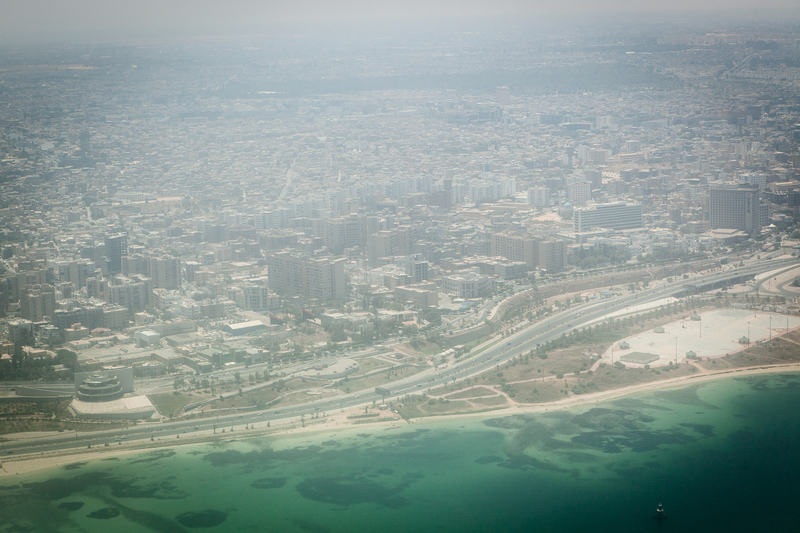 Tripoli, 12 July 2015. 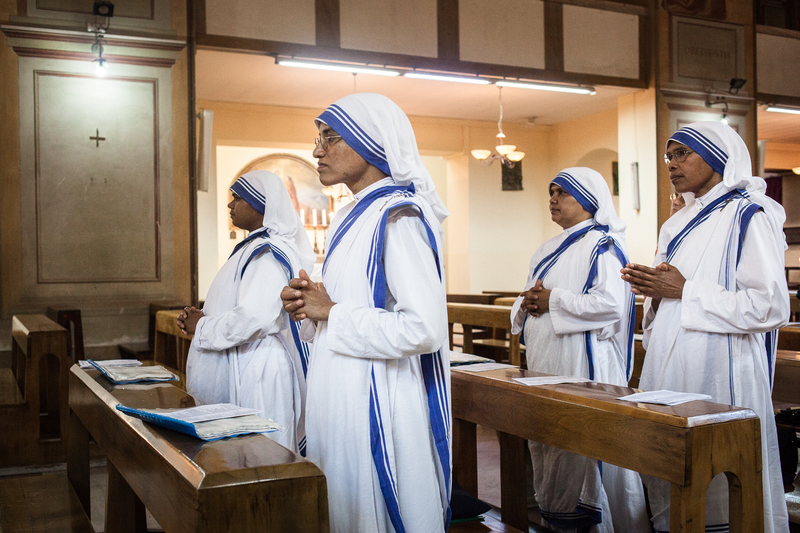 Missionaries of Charity (Mother Teresa) regularly attend the celebrations in the Church of St. Francis in Tripoli. They are eight in Tripoli, running a disabled children’s center. 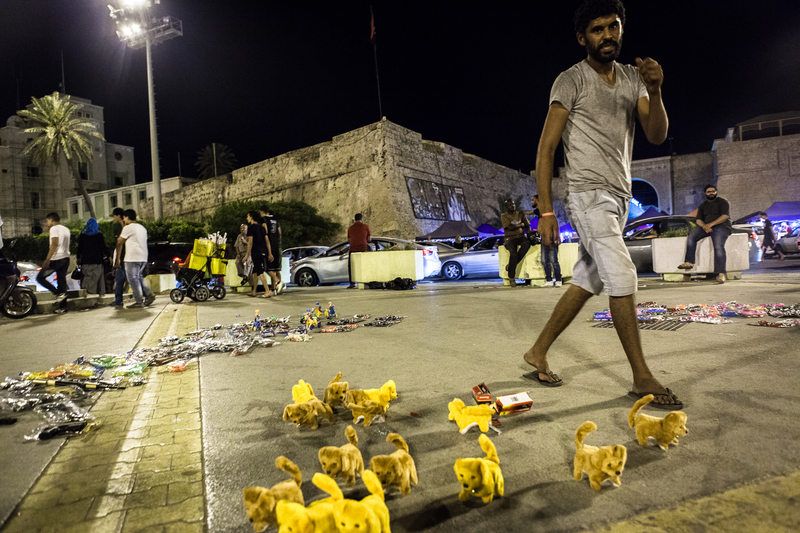 Tripoli, July 12, 2015. The Apostolic Vicar of Tripoli Mgr. Giovanni Martinelli, 73, in office since 1973 in St Francis church. 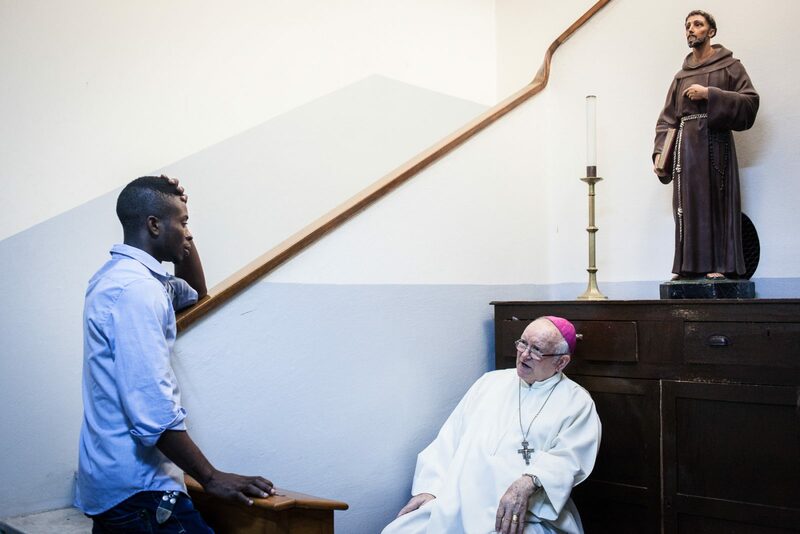 He observes a sharp drop in attendance in his church and the number of Catholic practitioners in the city since the fall of Gaddafi. Tripoli, July 13th 2015. 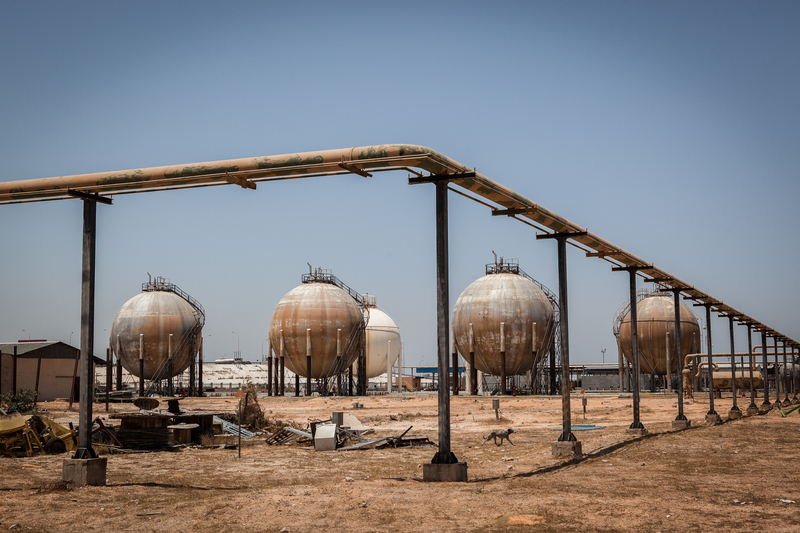 Fuel and gas storage and distribution facility belonging to Brega Petroleum marketing, a branch of the national oil company (NOC), in Libya. Tripoli, 13th July 2015. Breaking the fast of Ramadan in Martyr square.